Oooh this time of year simply is fun fun fun! 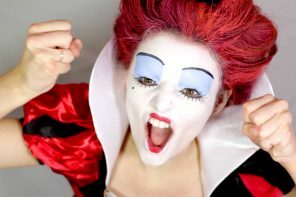 There are so many great Halloween party ideas and activities from you to choose from (simply browse our blog and you will be quite a busy bee!). 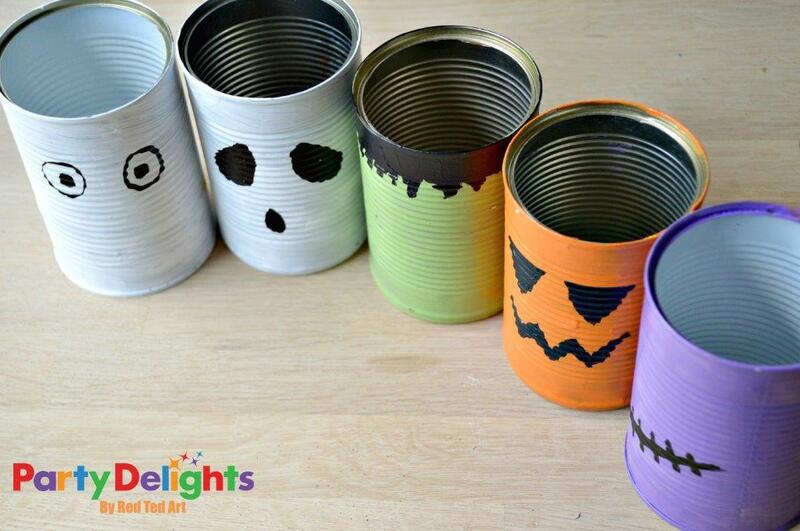 Today, we have for you a fun craft to make with or for your kids this Halloween: (not so) ghoulish tin can bowling. 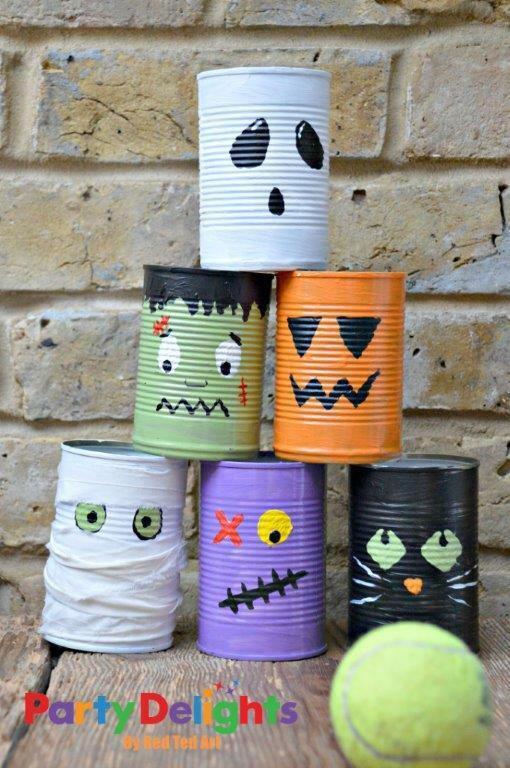 It is a great way to upcycle some of those old baked bean cans and turn them into a fun filled Halloween crafty afternoon followed by a great Halloween party game! 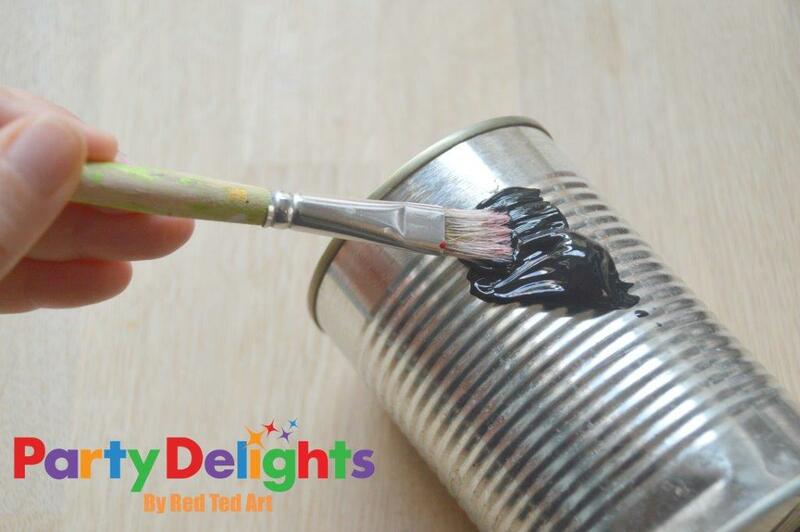 NOTE: if you don’t have acrylic or enamel paints or do not wish to use these with kids.. you CAN first cover your tin cans in tissue paper and PVA glue to form a basis for other paints to be applied to. Of course this will also give your tin can a “new texture”, which could be quite a lovely additional effect! 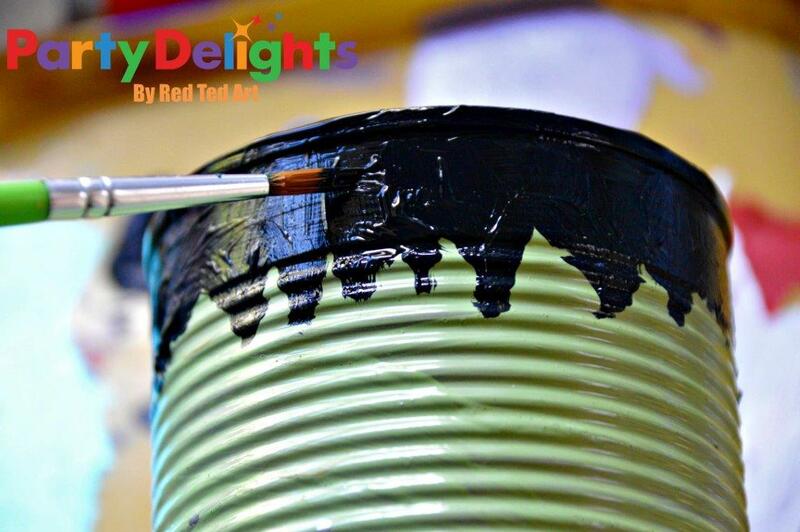 1) Begin by cleaning your tin cans and peeling all the paper off – don’t worry if there is some glue residue – usually this is only a “strip” at the back of the can and you can make sure that this is “into the back” of your final Halloween design. 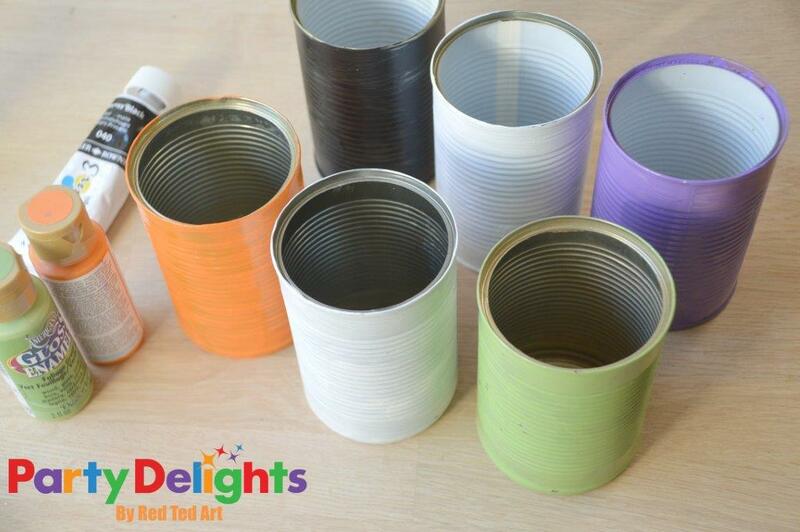 2) Paint your cans in your base colour – we used white for the ghost and mummy, black for the cat, purple for the zombie, green for the Frankenstein and orange for the jack O’lantern. If you don’t have that many colours – why not focus on a set of 3 different designs and make two of each? Or even just make one design – 6 times over! 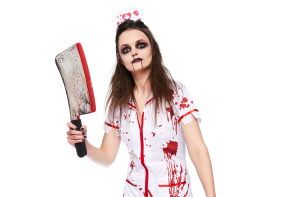 It will still provide you with lost of crafty satisfaction and Halloween party fun!! 3) Once fully dry you can start with your more detail designs. We chose to work with “black next”, as we could do several details on the different cans one go – black eyes for the ghost and jack O’lanterns, black hair for the Frankenstein, etc. 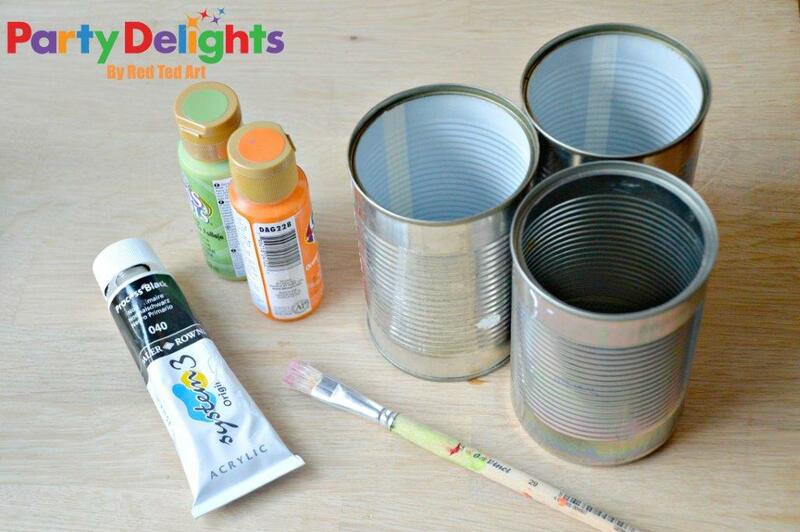 TOP TIP: If working with kids or if you are nervous of painting details onto your tin directly (don’t worry we know how it feels to put brush to can!! ), why not cut out the details from black card or felt and glue them on instead? 4) Once dried, we moved on to white – white acrylics usually are an “opaque” base colour and you should be able to paint over any other colour with this. If it helps… you can use white to paint the cats eyes and the zombie’s details first and then paint over it with the “weaker” greens and yellows. But really, you need to experiment with the paints you have see how well the different colours apply. 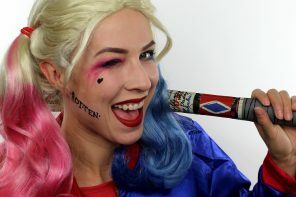 Add any other details (see our creations) – such as red or black scars. 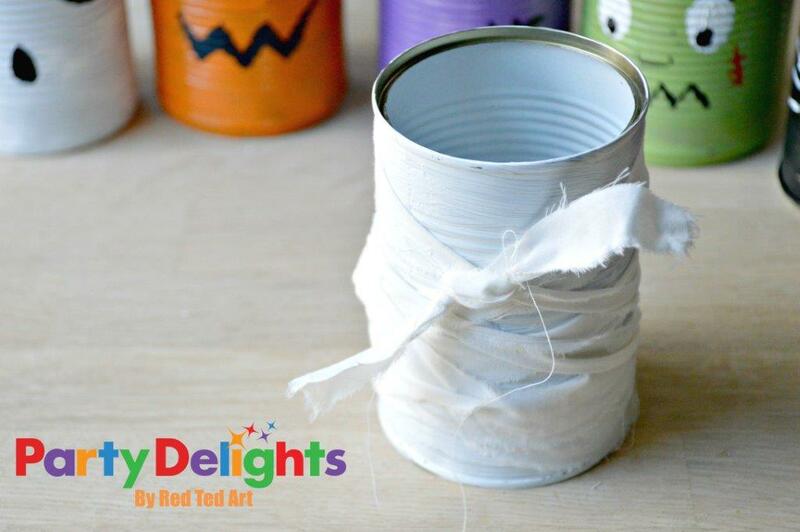 Finally… this was our favourite can… if you have an old baby’s muslin or an old pillowcase or faded tea towel (we pinched some off our DIY Mummy Costume), cut thin strips… and wrap it around your mummy can. Then tie a not at the back to secure it. Too cute. Stack them. Find a tennis ball and away you go!